Gigantic living and dining area including multiple couches, , a wet bar and an eight-seat dining table. Complimentary round-trip airport limo service is included in your reservation. For a few years now, most Vegas hotels are charging resort fees. Those fees are a fixed amount per night. In exchange for those mandatory fees, you will get complimentary access to certain amenities and services listed below. At the Planet Hollywood, Resort Fees are ﻿﻿charged ﻿﻿$37+tax/night and are mandatory. Total Rewards players with Diamond or Seven Stars status can waive the resort fee. 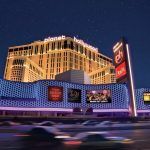 PLANET HOLLYWOOD: Elite Sale 30% Off!